We heard rumors about a mysterious "Xperia i1" a while back, but now it showed up for real. Sony's new Xperia z1 is the biggest Xperia yet at 5 inches, but more importantly, it's got a killer 20.7 MP camera on it too. The Z1 packs its blazing 2.2GHz quad-core Snapdragon 800 brain, 1080p display (exact resolution unknown), 3,000mAh battery, and 20.7 megapixel camera all into a slim waterproof (up to 5 feet!) body, made out of one piece of aluminum. 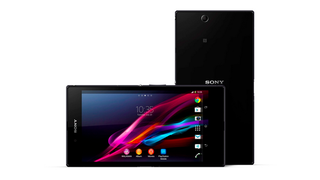 The Xperia Z1 will launch with Android 4.2.2, complete with Sony's typical UI slathered on top. The camera boasts a 1/2.3-inch sensor, roughly on par with the one in the Galaxy S4 Zoom. It's no Nokia 1020, but then that's a high bar to jump. Still, it's one of the beefiest cameras we've even seen on an Android phone. And it's got some fun features too, including a burst option which lets you fire off 30 shots with a single press of a button. There's no word on the price, but Sony will be releasing the Z1 sometime later this month.